With Gear Swapper you can easily define up to four different sets of hotbar + armor and switch with them easily. It works in-game with a block. Sneak-left-click on one of the four slots to remember your current hotbar+armor selection in that slot. Your armor and hotbar remains on you. The block will also remember how many you had of the given item and it will attempt to restore that amount later. Right-click on one of the four slots to restore the hotbar+armor as it was remembered then. All items currently in your hotbar or armor that are in the way for the remembered items will be stored in your inventory. All slots that were empty when you remembered your setup will be unchanged (i.e. it will by default not empty them). 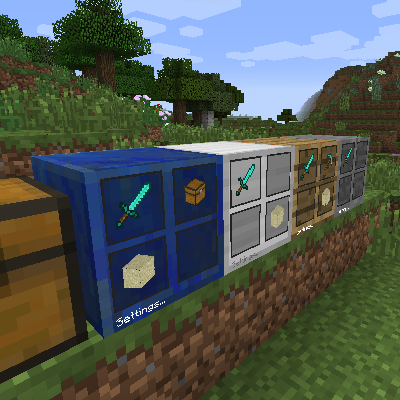 When restoring a selection the block will first look in the player inventory, then in the local inventory (a 4x4 internal buffer) and finally in any possible adjacent inventories until it finds the items it needs. The Bauble inventory (when present) is also supported. The top-left configuration (top row in the gui) is configured with your prefered mining gear. i.e. sword, pickaxe, torches, some sand and good armor. The slots that are crossed out (two of them in this selection) will be cleared. The other two slots are left alone (i.e. whatever is there will remain there). The top-right configuration (second row in the gui) is configured for gardening. No armor is desired here. The bottom-left configuration (third row in the gui) is configured for tech work. The bottom-right configuration (last row in the gui) is configured to clear the hotbar and armor slots completely. 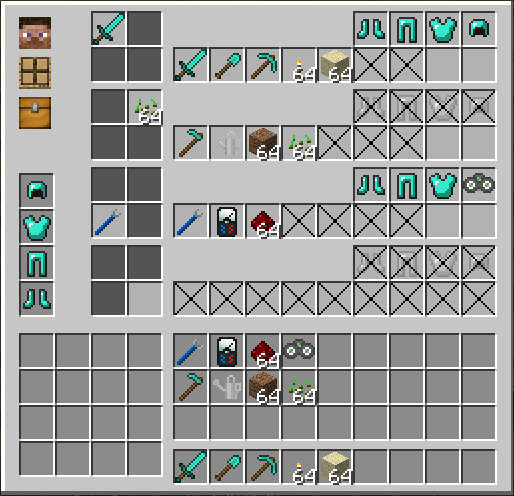 The three icons on the top-left of the gui show the preference for storing items from your hotbar and armor when you restore a different selection. The default settings are to first store items back in the players inventory. If that is full it will go to the internal inventory and if that also fails it will store it in an adjacent inventory. If that final fallback would also fail it will simply throw the items in the world. Nothing will be lost. By clicking those three icons you can change the priority. For example. If you prefer that armor and tools that are stored away should go to the internal inventory then you can change the top icon until it resembles the wooden icon with the four boxes on it. There are five different gear swappers (stone, wood, lapis lazuli, iron, and glass) and you can also configure another one with a modded texture through the config. Modpack Policy: Feel free to use this in any modpack. Hooray! I've been looking for some sort of wardrobe mod, and this looks promising. Thanks! Can you add compatibility to Cosmetic Armor Reworked? The recipe dont work and no show in the JEI. What are the chances of a ender gear swapper that works like the modded enderchest? I was thinking an Ender Gear Swapper would have the 3 color code system. So if you had 2 or more ender gear swappers that all have the code, blue blue blue, they would all have the same inventory. That way you can have a second base 1,000s of blocks away and be able to use Ender Gear swapper to swap your gear at either base. So fanboying right now, omg... The wonders I can make now in creative, without having to manually swap all my block pallets in and out by hand, or set up static command blocks to do it for me. Just started playing around with 1.10.2, and am so glad to see this one's available. It's been in my "must use" mods list since the moment I first tried it. Simple, but extremely useful and powerful little mod! It keeps clearing all the slots that are empty with or without the cross over. A workaround for this until the mod gets updated is to fill the slots you don't want to change with an item that you will never have on you, like leaves. I just had this issue with 1.4.1 on 1.10.2. Ate my hotbar, had to restore pfile from a backup. Do you have a consistent way to reproduce this? Update to what? Gear Swapper already works on 1.10.2 so what is there to update?